For many people, a "traditional kitchen" conjures fond memories of visiting the home of a beloved friend or relative. Perhaps your childhood home featured a kitchen that regularly filled with visitors. If this is the goal of your kitchen remodel, let Improvement Center provide a few pointers. Traditional kitchens often include natural elements, like warm wood tones, granite countertops and subtle color combinations. They can range from slightly modern to somewhat rustic to almost antique-feeling. Traditional kitchens steer away from fads and trends, instead aiming for elegance and timelessness. 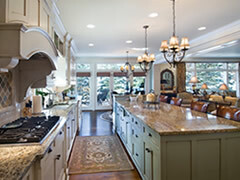 Most traditional kitchens incorporate tasteful layers of detail to achieve a rich, luxurious feel. There is no streamlining in traditional kitchens; in some cases, the more mixing and matching of complementary elements, the better. Solid oak, cherry or maple cabinets with arches, detailed molding and ornate, metal hardware--all of these fit the bill. The goal of a welcoming atmosphere necessitates a comfortable seating area, as well. Look for conventional yet charming wood tables and chairs, or sturdy nook tables with high-backed benches. Paint the walls in muted, natural hues like cream, mocha or sage. Browse interior design magazines, and the homes of friends or relatives, for ideas. Make a list of what you'd like to change about or add to your kitchen. Measure all spaces meant for new cabinetry, large appliances, tables, islands etc. Ask neighbors and friends to refer you to local designers and contractors. Fill out the form at the bottom of this page to have contractors from your area call you. It's free and it's easy to get the answers you need to design a kitchen beyond your wildest dreams.